Maybe you braved the crowds on Black Friday. Or maybe you stayed home and ate Thanksgiving leftovers. Either way, Christmas is less than a month away and you still need a gift for that accordion lover in your life. Don’t worry, we’re here to help with our annual Accordion Gift Guide — a roundup of books, music, videos, and other goodies that will look great in any accordion player’s Christmas stocking. The new Roland FR-7x V-Accordion has had tech-savvy accordionists drooling since its introduction a few months ago. Improving on its predecessor, the already-popular FR-7, the new model features more sounds, faster response and higher sensitivity, and a USB port for playback and recording. Prefer the feel and sound of a classic, acoustic instrument? Check out the handmade concertinas built by Bob Tedrow of Homewood Music. More than just instruments, Bob’s concertinas are practically works of art, proudly billed as “150 years behind the times.” The waiting list for his concertinas is currently several months long, so act now if you want one by next Christmas. There’s a good chance, though, you’re shopping for someone who already has an accordion and what they really need is a lesson or two. (Not that you’d ever say that out loud…) A pair of Texas accordion teachers have great accordion lesson DVDs: for piano accordionists, try Debra Peters’ blues/rock accordion DVDs, while button accordionists will enjoy Sheila Lee’s DVD for beginners playing the GCF button accordion. I haven’t seen the full video yet, but I’ve also been impressed by clips of British accordionist Murray Grainger’s new DVD, Accordion: Mastering the Art . 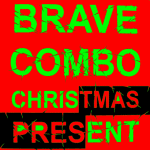 For holiday music, accordion-style, Brave Combo has just released a live holiday album called Christmas Present , a nice companion to their earlier releases Holiday! and It’s Christmas, Man . Their polka arrangement of “Must Be Santa” was borrowed by Bob Dylan for his new Christmas album, Christmas Heart , which features the accordion playing of Los Lobos’ David Hidalgo. Lighting a menorah instead of a Christmas tree? Woody Guthrie’s Happy Joyous Hanukkah , an album of Guthrie’s lyrics put to music by the Klezmatics, is a couple years old but still a great choice for a boisterous Hanukkah celebration. The holidays are fun, but they can be stressful, too; after weeks of shopping, traveling, and dealing with family, who hasn’t felt like locking themselves in the bedroom with a good book? We’ve got options there, too. Blair Kilpatrick’s Accordion Dreams , is a heartwarming tale of her transformative obsession with Cajun and Creole music. For a more historical perspective, Ryan Brasseaux’s Cajun Breakdown is one of the most thoroughly researched histories of Cajun music ever published. Need something to wear when you aren’t carrying an accordion? In addition to producing fantastic collections of folk music from around the world, Smithsonian Folkways has neat t-shirts, too, including this accordion-themed design. There are some great shirts on Etsy, too — this stenciled accordion shirt and the cheeky “Instruments of War”, which shows an accordion amidst a sea of weapons (club, axe, banjo). One of our favorite products of the past year is Elena Erber’s nifty accordion backstraps. Anna and I have been using them for a few months now and they’re comfortable, easy to adjust and great for your back. We’re also big fans of the annual Bay Area Accordion Babes Pin-Up calendar. It’s accompanied by a CD of folk, jazz, gypsy, goth, and pop accordion, just in case the eye candy isn’t enough for you. Want more ideas? 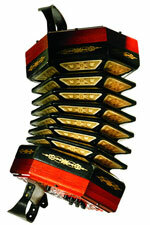 Check out our 2008 Accordion Gift Guide or browse our other shopping-related posts. And if you find other great accordion-related gifts out there, leave a comment and let us know! 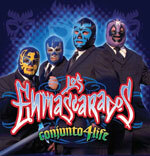 Combine KISS with lucha libre and put it to an accordion-fueled conjunto beat, and you have Los Enmascarados. Wearing the type of colorful masks typically seen on Mexican wrestlers — and hiding their real personas behind nicknames — this energetic band has a built a loyal following in Texas, even earning a Tejano Music Awards nomination. And, just in case you try to pick a fight with them, the band would like to remind you: “No Somos Luchadores” (We’re Not Wrestlers). 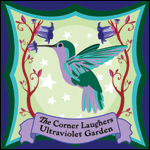 Our friends, The Corner Laughers, have just released their second album, Ultraviolet Garden , available from their website and iTunes. Anna is featured playing accordion on one track, and she also did the album art! During production of the track “Dead Sicilians,” the band brought Anna (and her accordion) on board to give the song an authentic Italian feel. From the decorative accents to the frenzied climax, the accordion really packs a punch. Check it out! Bette & Wallet is the Canadian duo of Mary Beth Carty (accordion) and Gabriel Ouellette (fiddle, guitar). 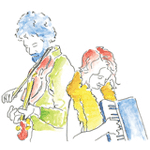 Hopping seamlessly between English and French, Bette & Wallet mix their Nova Scotian and Québécois roots with klezmer, Cajun, Irish, and blues to create a colorful musical patchwork you can dance to. Mary Beth uses the term ‘musique recyclée’ to describe their music — the art of combining traditional melodies with contemporary folklore — and its an apt description for their vibrant, authentic brand of folk. The duo has already earned Canadian Folk Music Award nominations and invitations to festivals in France and Canada. Is it a coincidence or is Bob Dylan a closet Brave Combo fan? Turns out it’s the latter — apparently Dylan once played the Brave Combo version on his satellite radio show. Yet another score for the boys from Denton.